The ADaM Order Processing system provides the efficiency and flexibility to maximize your customer service. 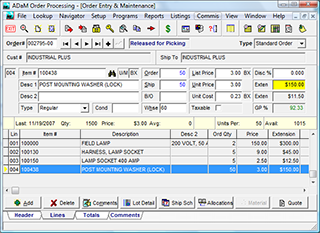 Designed for on-line order processing, customer orders are processed quickly while inventory & pricing information is readily available during the complete order process. A powerful pricing system and sales commission matrix allow almost any definable pricing structure. 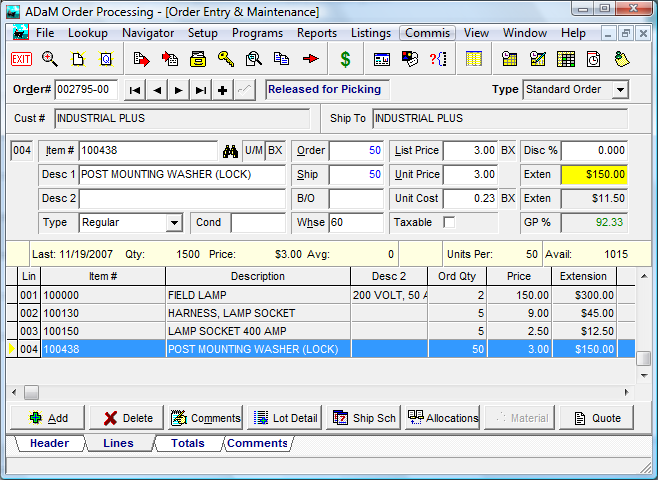 With flexible order lookups and instant product information, your customer will appreciate the efficiencies of ADaM Order Processing. Using ADaM software enabled us to process more than 2 million dollars in additional sales and we only hired one person to do it. On our old system it would have taken three new employees. - Jimmy Yundt, Roofmaster Products, Inc.